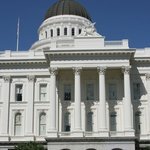 My favorite tourist attractions at the California State Capitol in Sacramento. See my travel photos from California State Capitol in Sacramento. Take your time to stroll through the State Capitol Park. Roses, palm trees, lemon trees and a pond. It’s beautiful ! Read my travel guide for the California State Capitol Park. Before heading further into the building, take a look at the displays showing all California counties. This is right by the Governor’s office. If you hang around a little longer you might actually get to see Arnold Schwarzenegger. You don’t actually have to wait around…you will know when he come out of his office. There are lots of tourists, especially Asian tourists that go nuts when he’s coming out. Visit the Rotonda and look up to see the inside of the dome. It is pretty cool. Wander to the right and to the left of the Rotonda and take a look at the old offices of the state controller and treasurer. They preserved them very well and they look great. I always like old stuff. On the outside the California State Capitol is very impressive. If you’re walking through the State Capitol Park and coming towards the State Capitol building you will start seeing it little by little through the many trees in the park. As you come closer and closer the building gets larger and larger until you’re right in front of it. It is an impressive building, all white and with a large dome on the top of building. The California State Capitol building in Sacramento is all white because it’s the White House of California. They did a very good job preserving the old offices of the various state officials: state controller and treasurer for example. There are about ten old offices to the left and right of the Rotonda. You get to see lots of old offices with a myriad of little drawers. All these offices have tall ceilings, I mean really tall ceilings. Old offices are on display at the California State Capitol museum in Sacramento. The California State Capitol is home to California politics. If you climb to the third floor you can actually sit in on Senate deliberations on the north side of the building or you can sit in on the Representatives deliberations on the south side of the building. Both rooms are open to the public and you’re welcome to listen as long as you don’t start shouting and protesting. If you do that you might bi taken away very quickly and end up in handcuffs. The Senate room, also known as the Red Room, is the California Senate deliberations’ room at the California State Capitol in Sacramento. If you live in California, you can’t help feeling proud when you walk around the California State Capitol. There is great history being shown everywhere in the building. I couldn’t help but think of how California started as the Wild West and where it is now as the largest and most powerful state in the US in terms of population and economics. This is the great state of California we’re talking about. The Great Seal of the State of California at the Sacramento State Capitol Museum. If you don’t come on a very hot day, you will have a very pleasant visit at the California State Capitol building and Park. There is a lot to see there and you could very well spend four to five hours inside and outside and still not see everything there is to see. If you like history then this is a great place for you. If you don’t I still think that you will enjoy the visit.